The circulation of books was the motor of classical civilization. However, books were both expensive and rare, and so libraries - private and public, royal and civic - played key roles in articulating intellectual life. 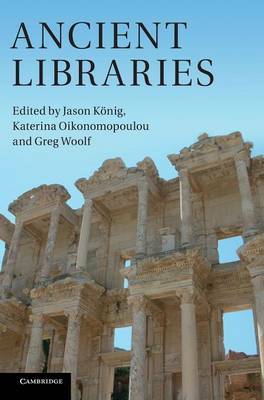 This collection, written by an international team of scholars, presents a fundamental reassessment of how ancient libraries came into being, how they were organized and how they were used. Drawing on papyrology and archaeology, and on accounts written by those who read and wrote in them, it presents new research on reading cultures, on book collecting and on the origins of monumental library buildings. Many of the traditional stories told about ancient libraries are challenged. Few were really enormous, none were designed as research centres, and occasional conflagrations do not explain the loss of most ancient texts. But the central place of libraries in Greco-Roman culture emerges more clearly than ever.